St. Matthew in his Gospel talks about sages from the East who at the time of the Nativity of Christ came to Jerusalem and asked where the King of the Jews was born. Learning this, King Herod became alarmed and sent them to seek Jesus in Bethlehem. Pointing the way, a star appeared before them. When the sages sought Mary and her Son in Bethlehem, they bowed before the divine Infant and offered him gifts: gold, frankincense and myrrh. The scene in which the sages worship the Infant Christ is called “Adoration of the Magi”. There is a tradition of portraying the Magi, like kings, for the Psalter says: “The kings of Tarshish and the islands will pay tribute to him… and all kings will worship him.” The Magi, according to Christian tradition, were called Caspar, Melchior, and Valtasar. The gifts they give to Christ have a symbolic meaning: gold to the king, incense to the Son of God, and myrrh, which is the symbol of death, the Sufferer. For the Christian, these gifts symbolize the bringing to Christ of prosperity, power, and also express the worship of Him and the willingness to serve Him. The work is dated and it dates back to the time when Ghirlandaio and his assistants worked on the frescoes of the large chapel of the Church of Santa Maria Novella. Also immense is the flooded landscape; the wall in the depth does not at all close the perspective and does not reduce space, but it contributes to its increase. At the request of the abbot, Tezori severed the altar and illustrated the episodes of Mary’s life. Scenes were written by one of the pupils of Ghirlandaio, Bartolomeo di Giovanni, as the documents and the characteristic elongation of the figures confirm. “Adoration of the Magi” remained in the altar until 1786, when the interior of the church was redone and the image was placed on the wall behind the altar. 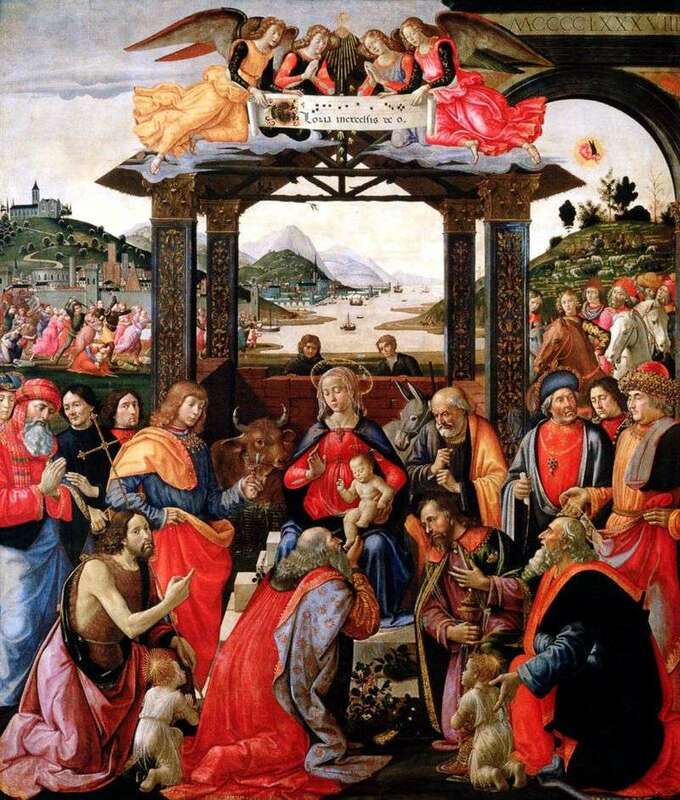 Description and meaning of the painting Adoration of the Magi by Domenico Ghirlandaio.